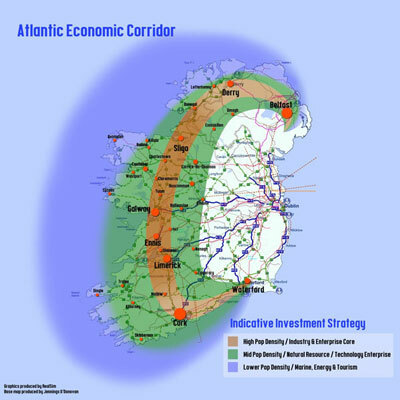 The Atlantic Economic Corridor is an initiative of the Chambers of Commerce of Limerick, Shannon, Ennis, Galway, Roscommon, Mayo, Sligo, and the American Chamber of Commerce. Collectively, they represent 73,500 employees, in 2,250 Irish-owned and multinational firms in the mid-west, west and north-west. Action Tuam is a local initiative to encourage and support business start-up and expansion in the Tuam Area. The Atlantic Economic Corridor passes directly through the town of Tuam and adjacent to the Action Tuam facility at Beech Tree Park. The corridor affords great opportunity for businesses in the Tuam area. The new M17 motorway will also provide easy access to other business on the corridor. The mission is an Atlantic Economic Corridor, with a ‘city of scale’ from Limerick through Galway to Sligo, to match Dublin and Cork in success in developing infrastructure, attracting Irish and multinational investment, and growing jobs and wealth in vibrant communities. - Strengthen enterprise development through alignment, collaboration and investment. - Create a dynamic ‘city’ effect of scale through an Economic Corridor. - Enhance the technology, research, skill capacity and reputation of the region. - Seek the infrastructure investment necessary to support this growth. - Promote a modern rural development based on rich natural resources and human capacity. - Identify and actively promote areas of competitive advantage. - Promote social cohesion and equality to maximise contribution and citizenship.